Pick the Perfect Neighborhood without Pesky Ethnic Groups Getting in the Way! Detroit-based startup Picket Report, "a new online research tool that helps homebuyers find their perfect neighborhood," is perfect for those whose idea of the "perfect neighborhood" means no scary poor people. Curbed got some screencaps of the website's "Struggling Societies" feature, which seems to have been deleted sometime today — we can't imagine why! 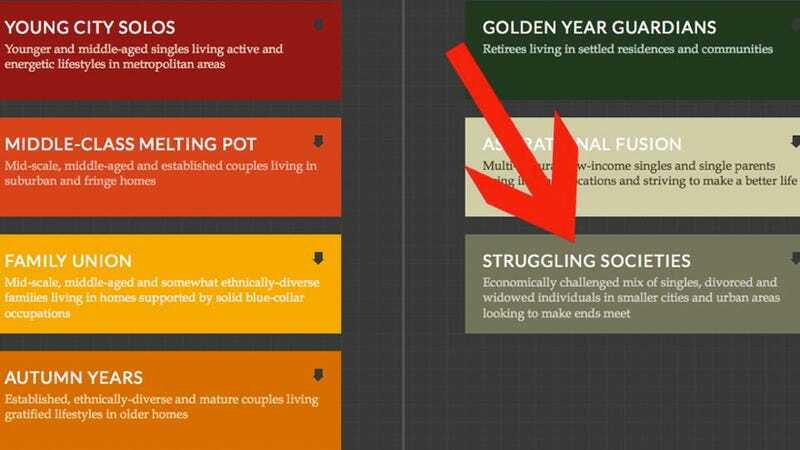 The tab originally let users know if their potential neighbors are likely to be an "economically challenged mix of singles, divorced and widowed individuals in smaller cities and urban areas looking to make ends meet." Soul Survivors: "Older, down-scale African-Americans singles and single parents established in modest urban homes." Hard Times: "Older, down-scale and ethnically-diverse singles typically concentrated in inner-city apartments." Soulful Spenders: "Upper middle-class African-American couples and families living in the expanding suburbs." Rolling The Dice: "Middle-aged, mid-scale income singles and divorced individuals in secondary cities." Silver Sophisticates: "Mature, upscale couples and singles in suburban homes." American Royalty: "Wealthy, influential and successful couples and families living in prestigious suburbs." Full Pockets, Empty Nests: "Empty-nesting, upper middle-class households with discretionary income living sophisticated lifestyles." And, obviously, no non-white people! So, next time you move into a new neighborhood and want to make friends, make sure to call that single Hispanic mother a "Ciudad Striver," or tell that middle-aged divorcee that he's "rolling the dice" by um, not being married? And try to get in with those "Asian Achievers," their "dynamic lifestyles" sound like A BLAST. When we called Picket Report to ask why they deleted the feature, they told us to email someone from their parent site, Quicken Loans, who has yet to respond. We'll update if they do.